“Rather suffer for 90 minutes than 9 years,” one of Bikram Choudhury’s infamous one liners delivered precisely as his students coast the edge of their own tolerance about halfway into a sweltering Bikram class. 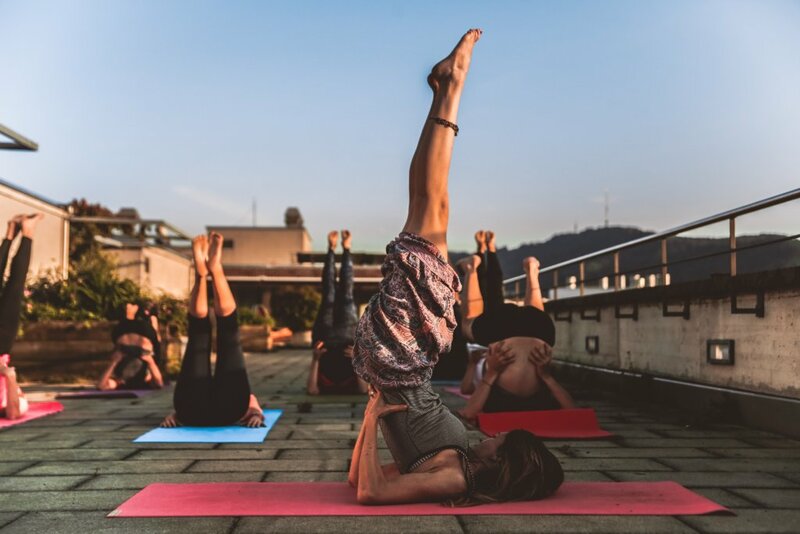 Although sometimes apart from the difficult postures and busy unfocussed mind, perhaps the hardest part about practicing yoga is just being able to get oneself onto a mat in the first instance. Having the time and mental energy within the 21st Century’s busy schedule to simply show up, can be a massive challenge in and of itself. Even after period’s of regular and consistent practice, interruptions, distractions and hurdles arise that pulls one away from almost any attempt at conscious action towards one’s goals. So what happens when it becomes a struggle to get into practice mode? Fortunately, the sage Patanjali, who authored the Yoga Sutras (the principle ancient text that outlines the tradition) lists 9 obstacles in the path of yoga. Knowing that when one feels agitated, apathetic or even to heavy to engage with one’s practice, recognizing these noted obstacles can help provide a strategy to keep going. When our body and health feel drained, tired and sore, it is completely natural to feel despondent, as though our health were completely beyond the reaches of our own control. Often this physical discomfort arises from imbalances and negative energy circulating from the mind. A restorative approach combined with full spectrum self-care can help dispel the challenge of Vyādhi. Quite prevalent in times of constant stimulation and searching for the next big thing and new experiences, many practitioners find that their initial excitement around the yoga practice fades and is replaced with dull ambivalence. We get tired with the pursuit of our goals as they fall into routine. How to connect back to one’s original intentions? To find focus, maybe even to change up the style or technique might just do the trick to re-engage one’s enthusiasm. Our subtle energies and rhythms change seasonally, why not let our practice mirror such shifts and satiate our needs accordingly? Always practice in a way that enriches one’s experience rather than dampen it. It is easy to become discouraged by the illusion of inadequacy, indecision and the pervading believe that the oneself is not worth the effort. When there are guests coming, we present ourselves at our finest, doing all the necessary preparations. Why then is it so challenging to do the same for ourselves; to believe that we are as worthy of our best efforts as anybody else? There is some injustice in the idea that every other being is worth our best, except ourselves. Perhaps this lack of confidence belies other issues, like arriving to busy classes, or intimidating spaces? To fill oneself with doubt is to doubt the entire nature of yoga itself born out of ignorance. If we experience the interconnectedness of all things, then how can our own doubt, that singles us out from the pack, be strong enough to overturn our entire faith within the practice but the faith that we have within ourselves? 21st Century life: distraction, distraction, distraction! As a society we are almost pre-conditioned to become distracted and in the process careless with our practice. Life has many offerings, time becomes difficult to balance between career, relationships, health, family, etc. Sometimes we forget to practice, and in the process we be negligent in looking after ourselves. Intoxication and addictions also fall under this hindrance. With so much stimulating our minds, sometimes we look to numb our own thoughts and escape the noise, one would imagine that yoga would be the ideal refuge. But, even during a yoga practice this obstacle rears its head usually in the form of frustrations and irritable states, where it feels futile to try and quiet the monkey mind. Set aside times for practice, remove all possible distractions and instead of fighting the distracted mind, let it run free; without attaching to thoughts, notice how the minds jumps from one thing to another. Eventually, like a busy toddler, it will start to tire and a stronger focus can resume. Sometimes words like ‘laziness’ is used, however, this carries a rather negative connotation as the heavy sluggish feeling bely other underlying obstacles as well. Burnout is a common cause of this hurdle. Instead of the common inclination to want force movement on the body, one can practice energy building and balancing pranayama and meditation, plenty of self-care practices to restore and recharge low levels of drive. Instead of fighting the sensations of the obstacles, which can make them feel unbearable over time, listen to what they are asking for instead. An open dialogue and intuitive sense of one’s own constitution can alleviate so much burden in the rest of life as well. This can be a powerful adversary, especially when it arises in the form of an impulse towards self-medication, or an urge to numb out and escape. This is where some outside sensory object seduces the mind away from one’s goals and progress, the effect is one of stagnation and even agitation. This is where a dynamic and flowing practice can break the energetic tie unto the sense object, something like many repetitions of Sun Salutations. Develop more self-discipline to self-practice more often than usual, this is easier today with the aid of apps and digital reminders as the craving mind is conveniently forgetful! It is important to remember that all of these cravings eventually subside. All sensations are temporary, they arise, often increase in intensity and then they pass away giving rise to the next. One merely need to ride out the wave. One of the greatest adaptions of the mind is the ability to create our own stories based on our experiences and perceptions that not only depict our behavior, but also justify it. Sometimes this creates a cognitive dissonance where our beliefs and thoughts are inconsistent. In Yoga, this is a very subtle obstacle that has the potential to unravel one’s progress and practice from the inside out. An example is becoming attached to a particular technique or style of yoga; many yogis become so loyal to a particular style or teacher that any other is discredited. Yoga is far bigger than just the way in which one practices asana, the end result is the same. If one’s practice environment is no longer accessible for whatever reason, one needs to practice non-attachment without allowing mental blocks to form and illusory ideas to guide one’s practice. This may lead one on a long detour towards one’s goals or completely off-course. Non-attachment unto all things is key, even when something works favorably, one has to be detached to remain open to all possibilities. Out of all the yoga obstacles, four comprise of different forms of doubt. This one however is a type of despondence that can be difficult to overcome. When it seems that there is no further potential for us, or maybe that the system is entirely practiced in vain. Perhaps a plateau has been reached, but this is merely a matter of perspective. When this doubt rears its head, one has to asses what one is using as a measuring stick for the so-called progress. Is it success in postures, or being able to recall from memory great lengths of philosophy, or is it that even with sustained practice we still feel massively negative states of mind? Perhaps the expectation is unrealistic in the first instance, for what arises from a continued practice is a full spectrum of experience, and the wisdom to deal with change with grace and elegance. With familiarity comes expectation, and as soon as we feel familiar and comfortable, we naturally tend towards thinking that we ourselves are an expert. This is where the doubt can truly take deep root and decay our practice. A firm and solid intention, a desire to better oneself, is a good place to start combined with an affirmation that yoga is for everyone. Dispel the illusion that one needs to be flexible, or strong, or really focussed to practice yoga; it is much more than exercise! Communicating these doubts with your instructor, for they are there to help and guide, will take some of the responsibility off your own shoulders and if something doesn’t work for your body, or confuses you, the experienced teacher will be able to shed light and adjust as needed. To practice the beginner’s mind, for the beginner always arrives eager and has everything to learn, one can keep abreast of doubt. One can experience that we are all forever learning and relearning. Each time we arrive on the mat, imagine it were the first time all over again, open to all possibility and ready to move into our true potential. There is always more to learn. They philosophy is one borne out of a belief that yoga is to be practiced over lifetimes, and many a yogi has gone into their last days hoping that they may be reincarnated in a form where they may continue to practice. What happens on the mat is very much a reflection of what happens off the mat. These obstacles apply to everything we strive towards. With a consistent, focussed and regular practice one can indeed equip oneself with the mental skills to overcome one’s deepest challenges, and to further one on a path of becoming the best version of oneself, with all intentions fully realized. With a well-rounded and grounded authentic teaching, one realizes how vast this ancient tradition spans. There is so much more than just contorting the body into supernatural shapes and breathing in often uncomfortable ways. It is through the process of navigating these physical and mental puzzles, that we are able to connect with various aspects that make us up.